Reversible vs. irreversible decisions. We often think that collecting as much information as possible will help us make the best decisions. Sometimes that’s true, but sometimes it hamstrings our progress. Other times it can be flat out dangerous. Many of the most successful people adopt simple, versatile decision-making heuristics to remove the need for deliberation in particular situations. One heuristic might be defaulting to saying no, as Steve Jobs did. Or saying no to any decision that requires a calculator or computer, as Warren Buffett does. Or it might mean reasoning from first principles, as Elon Musk does. Jeff Bezos, the founder of Amazon.com, has another one we can add to our toolbox. He asks himself, is this a reversible or irreversible decision? If a decision is reversible, we can make it fast and without perfect information. If a decision is irreversible, we had better slow down the decision-making process and ensure that we consider ample information and understand the problem as thoroughly as we can. Bezos used this heuristic to make the decision to found Amazon. He recognized that if Amazon failed, he could return to his prior job. He would still have learned a lot and would not regret trying. The decision was reversible, so he took a risk. The heuristic served him well and continues to pay off when he makes decisions. Let’s say you decide to try a new restaurant after reading a review online. Having never been there before, you cannot know if the food will be good or if the atmosphere will be dreary. But you use the incomplete information from the review to make a decision, recognizing that it’s not a big deal if you don’t like the restaurant. In other situations, the uncertainty is a little riskier. You might decide to take a particular job, not knowing what the company culture is like or how you will feel about the work after the honeymoon period ends. Reversible decisions can be made fast and without obsessing over finding complete information. We can be prepared to extract wisdom from the experience with little cost if the decision doesn’t work out. Frequently, it’s not worth the time and energy required to gather more information and look for flawless answers. Although your research might make your decision 5% better, you might miss an opportunity. Reversible decisions are not an excuse to act reckless or be ill-informed, but is rather a belief that we should adapt the frameworks of our decisions to the types of decisions we are making. Reversible decisions don’t need to be made the same way as irreversible decisions. The ability to make decisions fast is a competitive advantage. One major advantage that start-ups have is that they can move with velocity, whereas established incumbents typically move with speed. The difference between the two is meaningful and often means the difference between success and failure. Speed is measured as distance over time. If we’re headed from New York to LA on an airplane and we take off from JFK and circle around New York for three hours, we’re moving with a lot of speed, but we’re not getting anywhere. Speed doesn’t care if you are moving toward your goals or not. Velocity, on the other hand, measures displacement over time. To have velocity, you need to be moving toward your goal. This heuristic explains why start-ups making quick decisions have an advantage over incumbents. That advantage is magnified by environmental factors, such as the pace of change. The faster the pace of environmental change, the more an advantage will accrue to people making quick decisions because those people can learn faster. Decisions provide us with data, which can then make our future decisions better. 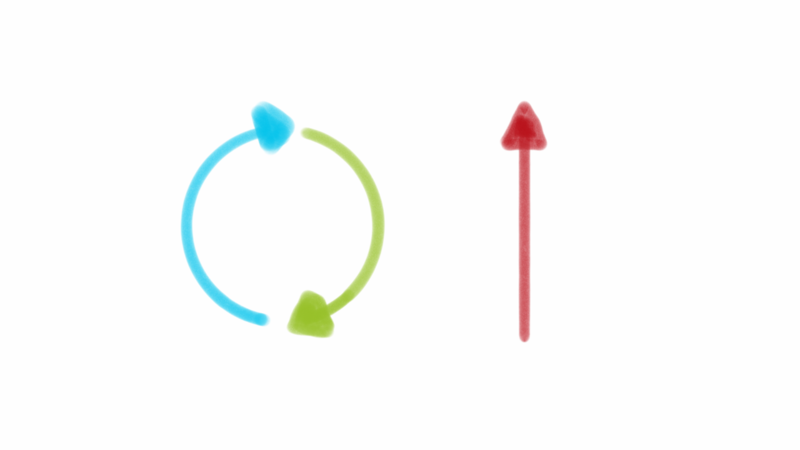 The faster we can cycle through the OODA loop, the better. This framework isn’t a one-off to apply to certain situations; it is a heuristic that needs to be an integral part of a decision-making toolkit. With practice, we also get better at recognizing bad decisions and pivoting, rather than sticking with past choices due to the sunk costs fallacy. Equally important, we can stop viewing mistakes or small failures as disastrous and view them as pure information which will inform future decisions. Bezos compares decisions to doors. Reversible decisions are doors that open both ways. Irreversible decisions are doors that allow passage in only one direction; if you walk through, you are stuck there. Most decisions are the former and can be reversed (even though we can never recover the invested time and resources). Going through a reversible door gives us information: we know what’s on the other side. Some decisions are consequential and irreversible or nearly irreversible – one-way doors – and these decisions must be made methodically, carefully, slowly, with great deliberation and consultation. If you walk through and don’t like what you see on the other side, you can’t get back to where you were before. We can call these Type 1 decisions. But most decisions aren’t like that – they are changeable, reversible – they’re two-way doors. If you’ve made a suboptimal Type 2 decision, you don’t have to live with the consequences for that long. You can reopen the door and go back through. Type 2 decisions can and should be made quickly by high judgment individuals or small groups. As organizations get larger, there seems to be a tendency to use the heavy-weight Type 1 decision-making process on most decisions, including many Type 2 decisions. The end result of this is slowness, unthoughtful risk aversion, failure to experiment sufficiently, and consequently diminished invention. We’ll have to figure out how to fight that tendency. As further guidance, Bezos considers 70% certainty to be the cut-off point where it is appropriate to make a decision. That means acting once we have 70% of the required information, instead of waiting longer. Making a decision at 70% certainty and then course-correcting is a lot more effective than waiting for 90% certainty. … the role of those other factors is so small in determining what is happening to the man right now that an accurate diagnosis can be made without them. In fact, … that extra information is more than useless. It’s harmful. It confuses the issues. What screws up doctors when they are trying to predict heart attacks is that they take too much information into account. We can all learn from Bezos’s approach, which has helped him to build an enormous company while retaining the tempo of a start-up. Bezos uses his heuristic to fight the stasis that sets in within many large organizations. It is about being effective, not about following the norm of slow decisions. Once you understand that reversible decisions are in fact reversible you can start to see them as opportunities to increase the pace of your learning. At a corporate level, allowing employees to make and learn from reversible decisions helps you move at the pace of a start-up. After all, if someone is moving with speed, you’re going to pass them when you move with velocity. Members can discuss this on the Learning Community Forum.